My senior year of high school, I went to Paris for the first time. My expectations were high; I’d romanticized Paris in my head for years. And when I got there, I was disappointed. Same thing happened in Dublin. I had these dreams of what each place would be like — I’d find my true love on the banks of the Seine, I’d drink a pint in a cozy wool sweater surrounded by the green hills of the Emerald Isle — dreams that reality could never match. What am I trying to say? That having excessively high expectations can lead to disappointment. Over the years, there is one thing that I’ve learned to have zero expectations of: anything purporting to be “NY pizza” outside of New York. In general, I try to avoid any establishment making such a claim at all costs. Last night, I threw all caution to the wind and visited Lenny’s NY Pizza Co’s location in Ormond-by-the-Sea. What lured me in you ask? Well, just do a quick image search for their garlic knots. It’s ok. I’ll wait. Oh, you don’t want to open another tab? Ok, well, I’ll just leave this right here. I don’t know what Lenny’s is like on a week night; we went on a Saturday at about 7:30pm and they were SLAMMED. Like the estimated delivery time was two hours. Our server was running all over the place. There was a back up for the oven, but every minute we waited was worth it. Also, giving ourselves a buffer between those garlic knots and the rest of the food was a-ok by me. After watching the most gigantic pizza boxes I’ve every seen go out the door (24″ is their extra large! ), out came the night’s special: a ziti bolognese (pork, veal, and beef in that sauce) and an eggplant stromboli. According to our server, that bolognese simmered for more than four hours. The meat was incredibly tender and the flavor of the sauce was spot on. Now, let’s talk stromboli. Lenny’s gets a 12/10 because they peeled their eggplant. This, to me, is the defining characteristic of people who know their way around such an Italian staple. If you don’t know what I’m talking about, have some eggplant parm with and without the skin. There’s a world of difference. So, eggplant: A+. The dough was perfectly crispy and gorgeously thin. And the cheese. Once my blogger skills get better, I’ll go back and boomerang the heck out of that cheese pull. I’m thinking of the leftovers in the fridge right now and I’m basically that drooly face emoji. No, we didn’t have pizza. I told you already, I have trust issues. But, through this showing, Lenny’s has gained my trust. Next time, we’ll get a slice…or maybe a whole pie. And yes, there will be a next time because Lenny’s second location is only seven minutes away from our new apartment. And, I owe you a cheese pull. I need to get out to brunch more often. Today I made it to AGORA, which is a couple of blocks from Dupont Circle. 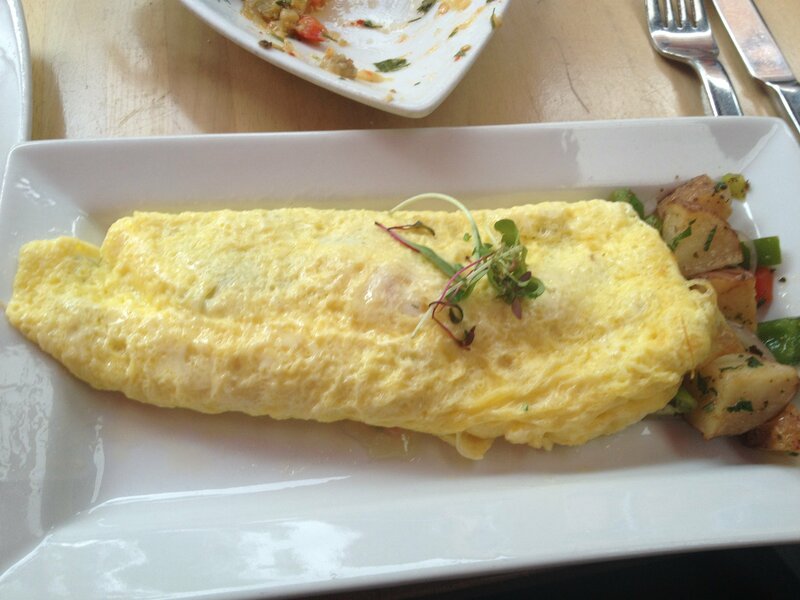 AGORA has a prix fixe brunch menu for $29.95 with bottomless drinks. They’re also nice enough to call out what menu options are gluten, dairy, or nut free for those that need to know. There was pretty much no way I wasn’t going to order this option right here. 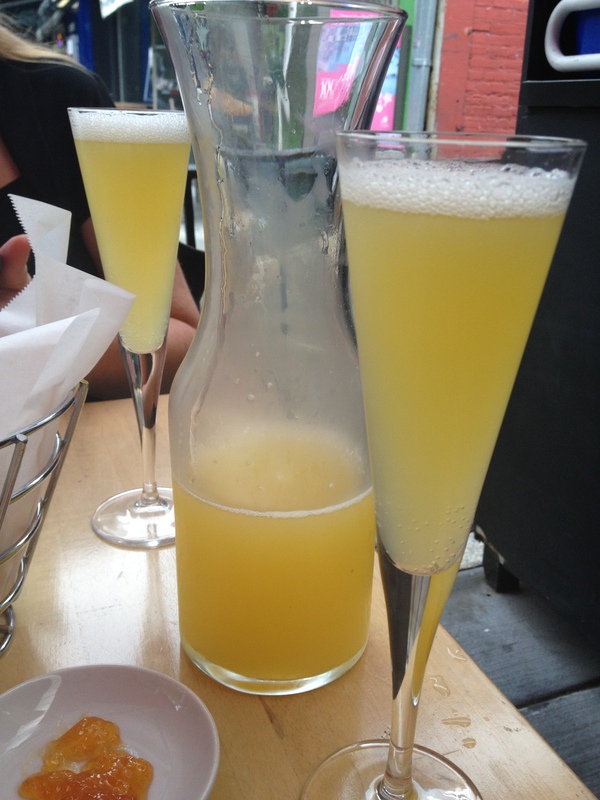 Being that it was 1130, I felt Mimosas were the best option, and out came a carafe (one of a few). The server also brought out some pita bread and apricot jam to start things off. The bread was piping hot, and was used to eat a lot of the other dishes. Essentially, as many of these as you want (in a two-hour span). I started off with Patlıcan Közleme (Charcoal smoked eggplant, green and red peppers, olive oil, lemon juice, garlic, parsley, dill) and Labneh (Strained yogurt, diced apples, walnuts, savory and endive). Both tasty starters. Eggplant spread with peppers. Good cold mezze starter. 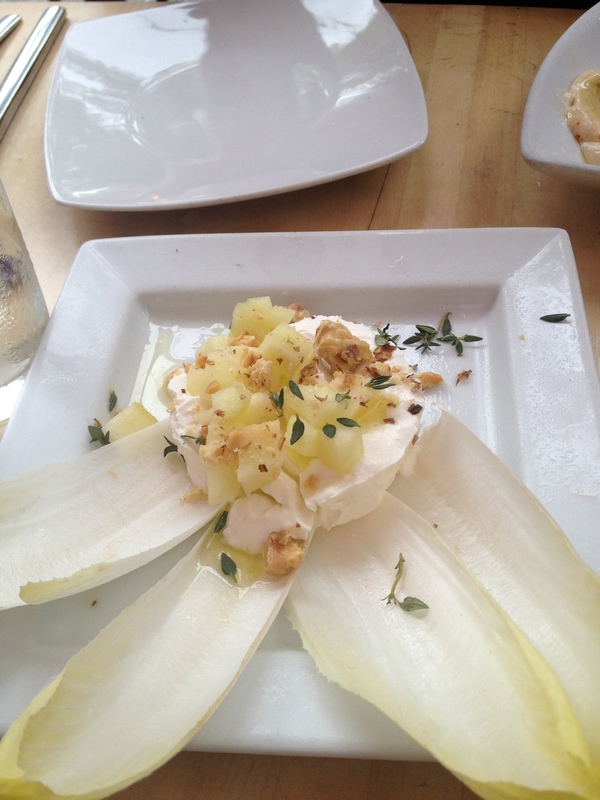 Another good starter…tangy labneh topped with diced apples. Next up, I picked the Manchego, Basil, and Tomato Omelette (three farm fresh eggs with manchego, basil and tomato, served with a side of potatoes that went well with the rest of the omelette) and Cilbir (two farm fresh poached eggs topped with yogurt, sumac and spicy oil). 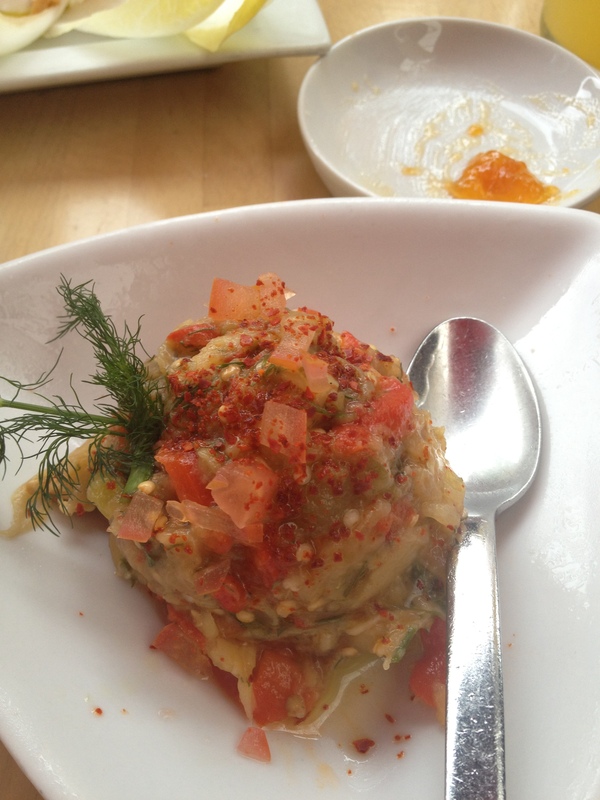 I first tried Cilbir at Zaytinya a few weeks ago, and this was just as good…before, I’m not sure I would’ve thought eggs and yogurt mixed together would be a good call. Manchego, basil, and tomato omelette. 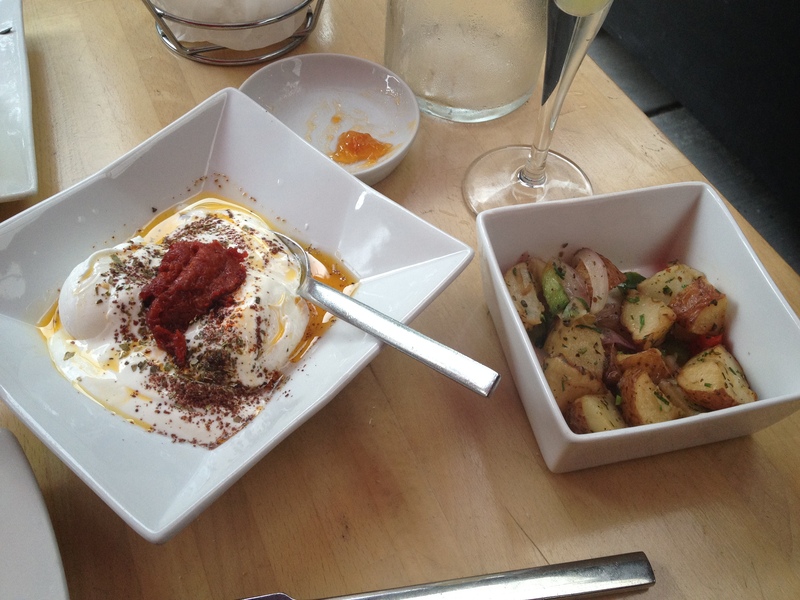 Cilbir…eggs with yogurt, sumac, and oil, with a side of tasty potatoes. 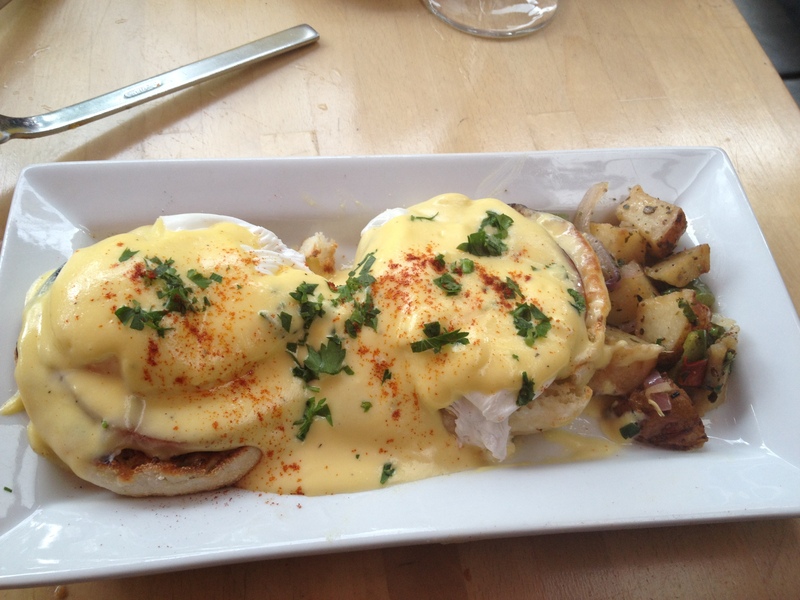 The Pastirma Eggs Benedict was really tasty…hard to go wrong with Eggs Benedict at brunch. 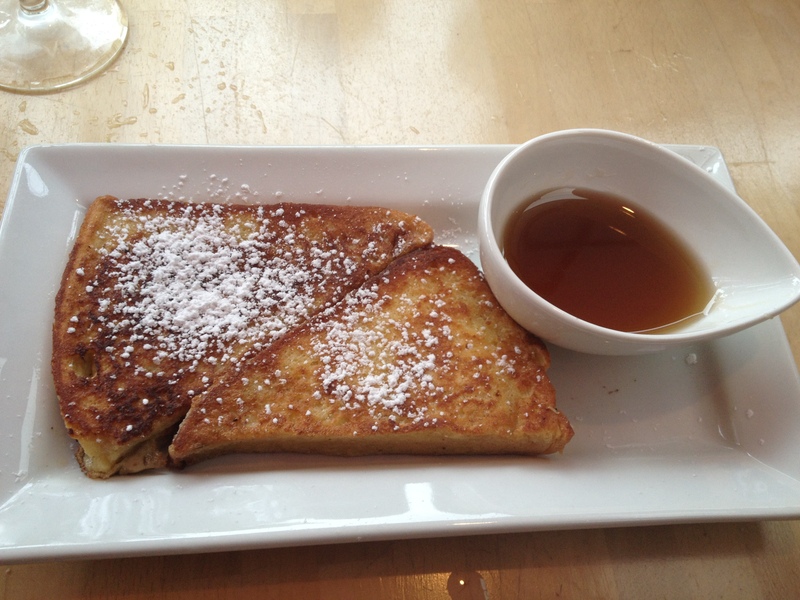 French toast…not much different from the norm here. 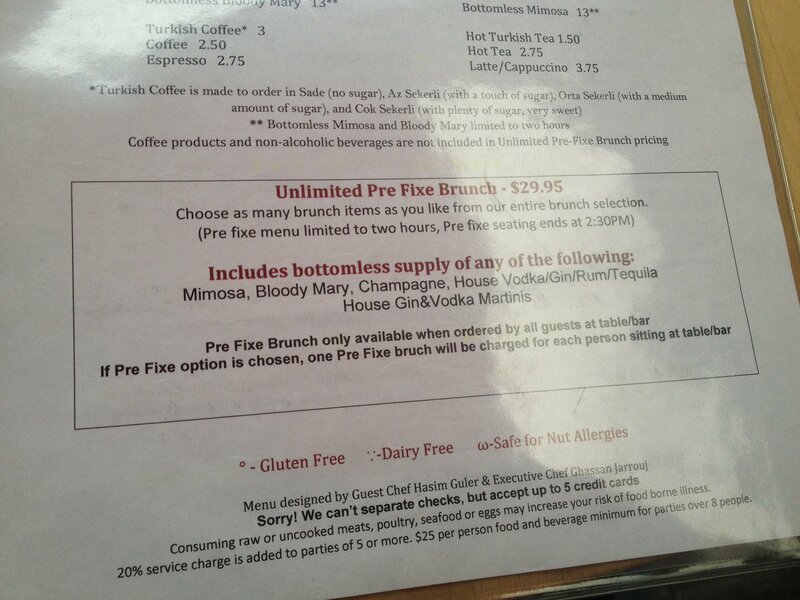 This was a good bottomless brunch for a good price…I’d encourage you to check it out. I’ve had Filomena on my list for a bit. I’d heard great things about this particular Italian restaurant, so on Sunday I went to Georgetown to check them out. Upon entering the restaurant, take a look to the right before you go downstairs into the dining room. You’ll see a small room that looks like the kitchen of a home, where the restaurant’s homemade pasta is created. You can see some pictures of it here. 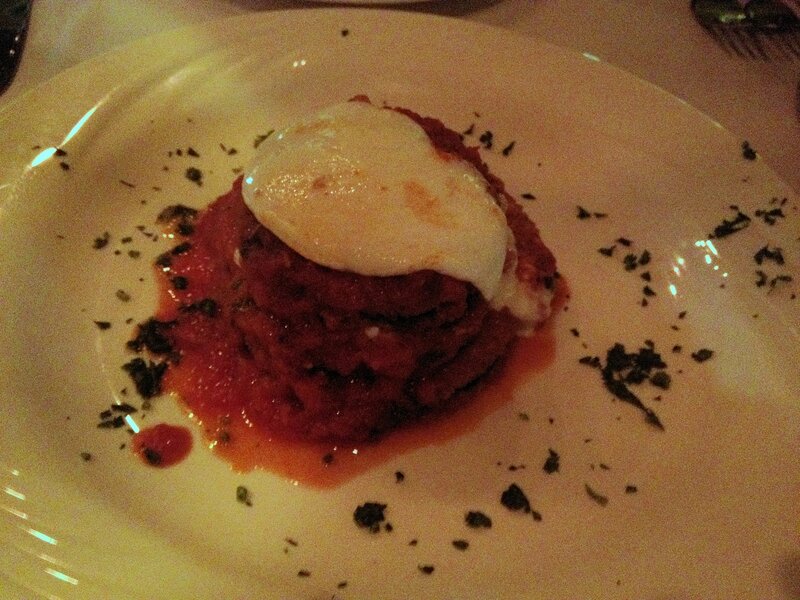 La Torre Di Melanzane – a delicious tower of eggplant. 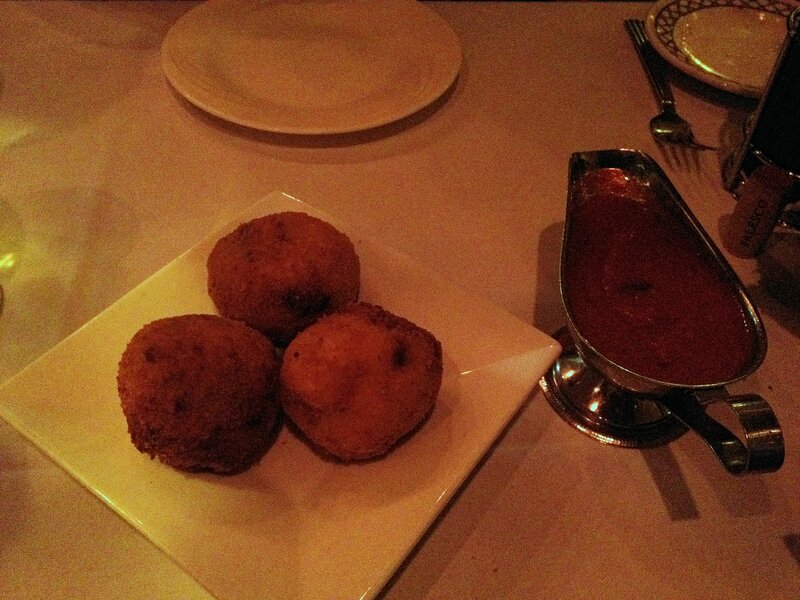 Arancini – fried balls of rice stuffed with meat and cheese. 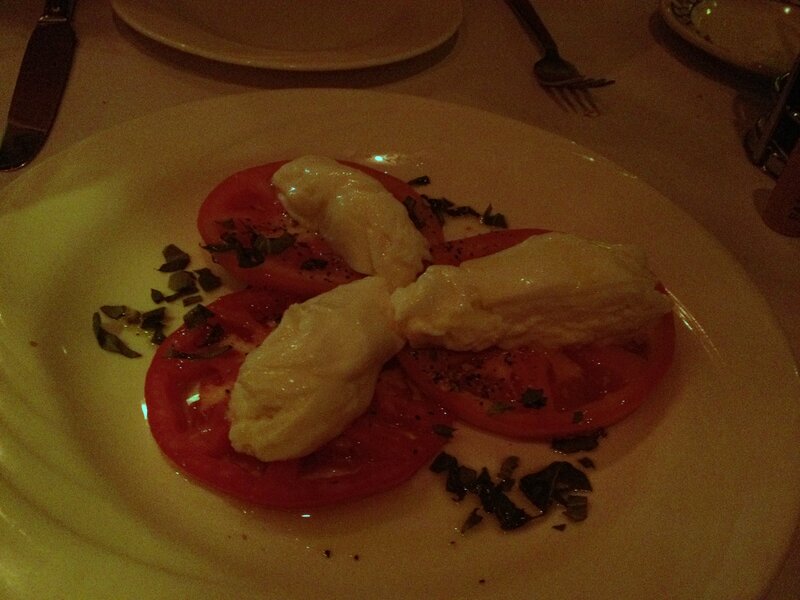 Burrata Mozzarella di Caprese – can never go wrong with cheese, amirite? Filomena has some large portions when it comes to their entrees. I went with Bill Clinton’s favorite Filomena dish, the Linguini Cardinale (lobster meat in cardinale lobster sauce over pasta). Loved it. Apparently Filomena sees a lot of other celebs (see here and here). My dinner companion got a special (the picture of which didn’t come out too well). The Risotto alla Vitello consisted of two giant veal chops over a bed of mushroom-prosciutto risotto. If I see this on the menu next time I go back, I’m getting it…delicious (and HUGE portions). Along with dinner, we had a Falesco Umbria Merlot. Worked well. There’s plenty of other options as well. 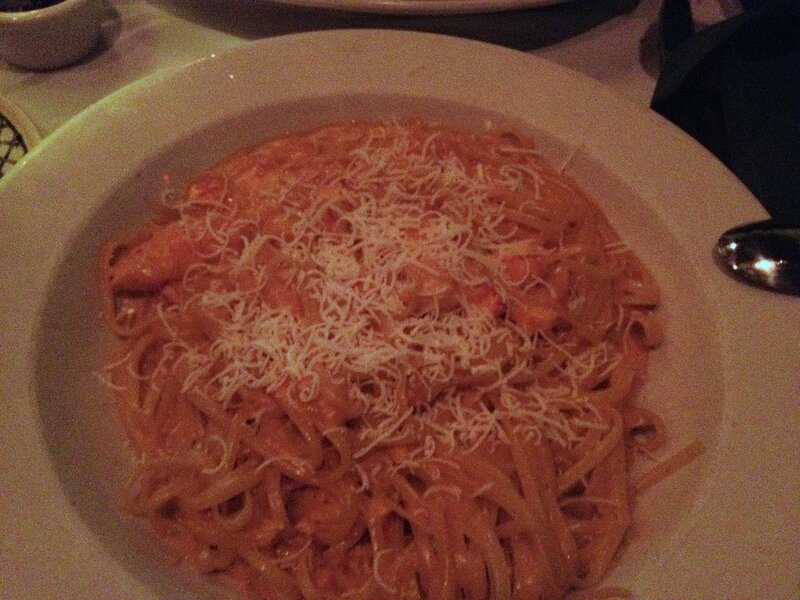 Bill Clinton’s favorite, the Linguini Cardinale. Although I was feeling pretty full at this point (I even had to get the rest of my food to go – never happens! ), I had to try the desserts. All of the cakes and tortes are on display opposite of the dining room, and the dessert menu displays pictures that will definitely sell you on that last course. The Hazelnut Daquois was awesome. 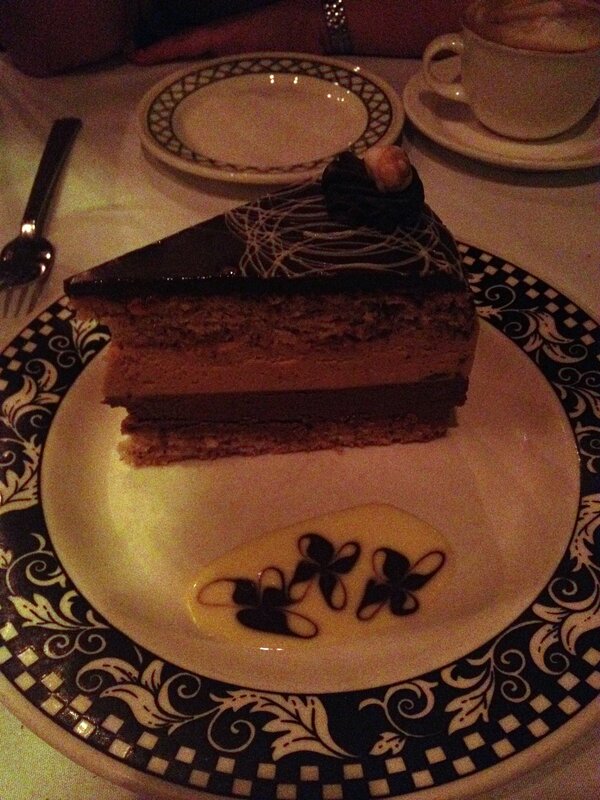 Filomena’s Hazelnut Daquoise was excellent. All the other desserts looked great too (especially the Cookies ‘N Cream cake, which looks like a big Oreo). See more on their desserts page. I thought I was finally done gorging after the dessert, but there was more. 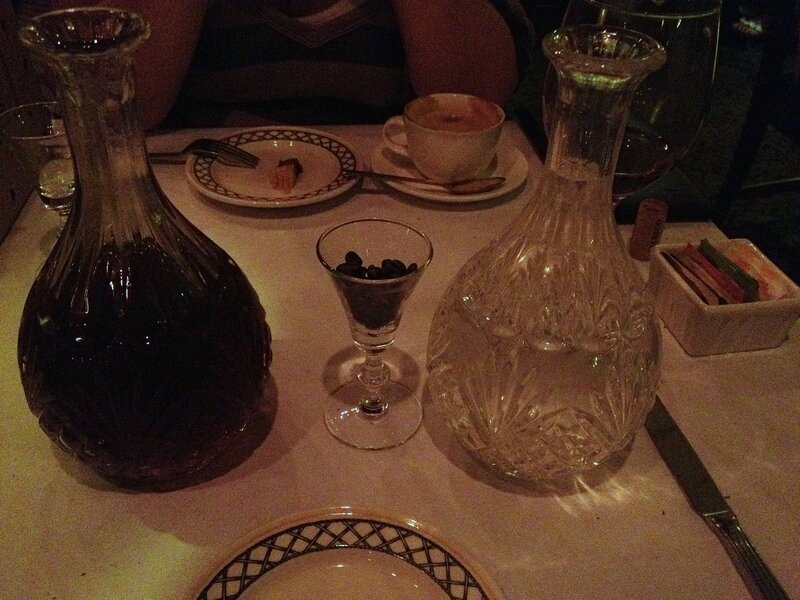 Deposited on the table along with the bill were two decanters – amaretto and sambuca. Was great post-dessert. Amaretto and sambuca to finish things off. Served with coffee beans for the sambuca. Apologies for the photos…the restaurant is dark and romantic…definite date night quality. Great food as well, so you can go alone if you have to…worth it!